Dr Mick Craig completed his undergraduate degree in Neuroscience at the University of Glasgow in 2006. He then moved to the University of Oxford to study on a four year Wellcome Trust DPhil in the OXION programme, working with Prof Ole Paulsen and Dr Louise Upton, graduating in 2011. In the final year of Mick’s doctoral studies, Prof Paulsen moved to the University of Cambridge to take up the Chair of Physiology, so once Mick completed his DPhil, he spent a few months in Cambridge before moving to the National Institutes of Health (Bethesda, USA) in 2011, to work as a Postdoctoral Visiting Fellow in the group of Dr Chris McBain. 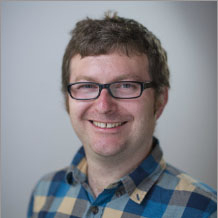 Subsequently, Mick moved back to the UK in early 2016 to establish his research group at the University of Exeter on a Research Fellowship funded by the Vandervell Foundation. Mick is a neurophysiologist interested in how interneurons can control synchronous neuronal network activity, and how different brain regions coordinate their activity across long distances. While comprising only a small percentage of cortical neurons, inhibitory interneurons play a fundamental role in coordinating and pacing the rhythm of neuronal oscillations. Mick’s previous work has included studying slow oscillations in sensory and entorhinal cortices, and faster rhythms (gamma oscillations and sharp-wave ripples) in the hippocampus. The research in Mick’s group uses a combination of behavioural, in vivo and in vitro electrophysiological and optogenetic methods to understand the cellular circuitry through which different brain regions communicate across long distances. They are also interested in studying how these long-range projections are disrupted in psychiatric and neurodegenerative disorders. See his official staff profile here.